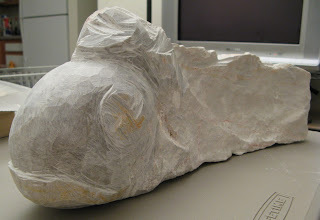 I have been working on my fish sculpture. I have made some progress as you can see here. I will probably change the shape of the head some more. Bring down the forehead a little and incline it more sharply so it isn't so rounded. I'm struggling a bit with this one. This stone already has a very specific shape and it already feels like a fish. I fear the only thing I can possibly do is screw it up. I can see how I can utilize the shape, but I'm lacking confidence. Especially with the fins. So I've decided to try to model in clay where I can go with it. In the past when I've done this, I found that I actually like to work the clay like I work stone. Take away and not build up. I mean, I'll add clay to build up an initial chunk, and I'll add clay if I go too far while removing something, but I feel best when I'm removing the clay to reveal the form rather than just trying to build it up. Sort of like problem solving how I might actually tackle the stone. Anyway, that's what I've done above. I created a (crude) model of my stone as it currently stands, and now I'll try to figure out how to make the most of it. By the way, while I was working with the clay the other night, I was watching a terrific program on PBS called Craft in America. There was quite a bit of wonderful work on display in all manner of styles and media. Inspiring stuff. You should catch it if you're into that sort of thing. UPDATE: It appears we have a winner: #2! As Nate said, "Yay for #2!" Interestingly (for me), when I first posted these candidates, I was initially thinking that #1 was the best (which didn't even get a single vote). Then after seeing all three of them together on the blog I started to think #3 was better, but primarly for the reason everyone mentioned: it's pretty. However, it is now clear that #2 is superior since it meets both criteria mentioned as well as being a subtle dig on that other loathed bumper sticker. I am convinced. Come to think of it, I like that the map in #2 doesn't quite stand out like the other two. It will require more attention from the viewer which will hopefully lead to the AH HA moment I'm looking for. Thanks to everyone who voted. I'm off to get some stickers made. After moving to Colorado, one of the first things I noticed were the occasional "NATIVE" bumper stickers like the one displayed here. Not being "NATIVE" to anyplace other than the U.S., I tend to take these particular bumper sticker statements a little more seriously than I know I should. It just bugs me that somebody who happened to be born in this state or can perhaps trace their family back a couple of generations thinks they are somehow better than the rest of us filthy new comers coming here improving the economy like a bunch of lousy so-and-sos. I know these bumper stickers aren't all the frequent these days, and I'm sure the people who bother to put these bumper stickers on their cars actually mean it in a joking way or more in the silly, possessive way people will make sure you know they were into something before you were. However, as anonymous statements on the rear end of cars, they don't quite come off that way. Especially if you happen to be the non-native. Anyway, I have an inclination to want to stamp out all the useless, needlessly divisive tribal allegiances I come across. I prefer to be as inclusive as I can. I claim all of humanity as my tribe. We're all natives of earth. I'm sure my attitude is just a defensive mechanism to avoid being rejected (or whatever dismissive rationale you wish to apply). Of course, it doesn't work very well for that end since as far as I can tell most people don't feel the way I do. Regardless, I too wish to wear my heart on my bumper just like the Colorado nativist movement, but I can't seem to find an appropriately designed bumper sticker. So, I came up with my own. I'm attempting to match the feel of the other bumper sticker as much as possible to make it clear that I'm poking fun at stupid bumper stickers, but at the same time I want to make clear my own position. So, I need your help, friends and family. Help me choose which bumper sticker I will place on my vehicle. You can vote in the comments or email me. I know these designs leave a little to be desired, and if I was willing to spend more time than what I already have, I would probably try to fix them, but these are the finalists. I already have my own opinion, but I don't want to bias your own. I'm not necessarily looking for the prettiest image. I'm looking for the image that reads most readily. So, it needs to do two things. 1) Scream WORLD MAP! and 2) NATIVE needs to be legible from a large distance. I think if the sticker can do those two things, then it will probably get my view across while simultaneously giving the hand gesture of their choice to all those native Colorado bumper sticker people out there. So, what say you, people of earth? Which of these stickers works to those ends? He who quarrels with himself will never lack for a dispute. 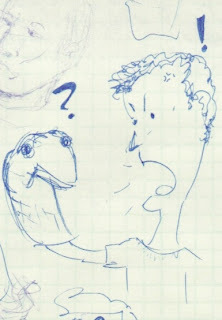 That doodle above is an illustration of a fight I had with myself. I thought I made some good points early on. But in the end I became frustrated and shamefully resorted to name calling. Eventually I had to just agree to disagree with myself. My red pen finally ran out of ink. Anyway, I'm working on more substantial things, but this will have to tide me over for a bit. I was going to post this later, but I didn't want the previous post to be the first thing on my blog for very long. Even though I only linked to a trailer, and even thought I don't think we should be afraid to explore topics (especially in stories), there are some things I don't necessarily want to dwell on either. Anyway, I found a cute short story that I would like to share. I hope you enjoy it. Notice how much is not said in this story. Of course, this time the author expects you to already know what he is referring to. It's useful to have a shared context with your audience. I was reading this post about elements of story. In particular, how much you can leave unstated while telling a story. I consider this a variation of focus (something the writers of Spider-Man 3 should have really worked on). For many of our media today like movies, TV, and other short form story telling, focus must be nearly relentless. Decide what your story is about and strip away everything that doesn't serve to tell it. Of course, leaving some things suggested or mysterious can also be a powerful way of drawing an audience in. Your brain will latch on to the mystery and mull it over. So, it's not just about focus. But mystery in a story can only take you so far. I admit that whole TV series have been based entirely on mysteries (e.g. X-Files, The Pretender, Lost, etc.). In the end, if all you have is mystery with no forward progress, the story is likely to be unsatisfying because, well, there isn't a story. All you have is a fictionalized mystery. Anyway, I realize I'm being vague. Maybe I'll expand more on that some other time should I ever feel sufficiently proficient in story telling. What I really want to point to is this trailer for "Day Night Day Night" linked to in the aforementioned post. It's just a trailer, but it suggests the movie has a relentless and intense focus and probably hasn't bothered to explain the whole context. One thing about leaving something unstated is that sometimes it's not meant to really be mysterious. Sometimes the story writer knows you will readily fill in your own experiences or fears. In fact, leaving something unstated can actually make it more powerful because of that. You don't know what it is, but you can't help but fill in the blank with your own personal demons. P.S. Honestly, the trailer made the hair stand up on the back of my neck. Considering the nature of the film, I don't know if I'll want to see it when it does arrive. Horror movies don't scare me. They just turn my stomach, and I usually don't bother watching them. But movies like what "Day Night Day Night" seems to be like can be very unsettling. They're the stuff of my nightmares. Imaginary monsters don't scare me. What people are capable of doing scares me. Having said that, I would probably see it given the chance. I don't believe we should be afraid to examine these sorts of topics. That gives them more power over us than they deserve. In the days before TV dominated all media, a newspaper's comics pages used to have a pretty good representation of genres. It wasn't all a gag a day or the occasional long form drama. Among other things, there was also adventure comics. Well the adventure is back, baby! Sorta. The adventure I'm referring to is not actually on the printed comics page. A site called Humorous Maximus is "reprinting" the Steve Canyon series a day at a time as it originally appeared. They started reprinting the series sometime in January of this year. Apparently the starting date was the 50th anniversary of the original beginning of Steve Canyon. You can get more information about the long running comic here. I'm not familiar with the comic myself. I know that Steve Canyon was well known and well regarded in its time. I've read a little bit of the series that they've revealed on the site, and I've enjoyed what I've seen. Considering the limitations of the comics form, Caniff seems to have done an excellent job moving the story forward without losing the thread. His drawing and inking style is effective as well, but I have to wonder if people actually ever talked like his characters do. The dialogue seems highly exaggerated, but it is entertaining. Anyway, if you like such things, don't miss it. If you're interested in stop motion animation, you should check out this trailer for a recently completed short film called "Madame Tutli Putli". I found the trailer from this post on the Drawn! blog. There's more information on the official Madame Tutli Putli site. If you watched the trailer, you may have noticed something striking about the character. The thing that stood out for me were the eyes. They looked too human. Sure enough if you look here you'll see that they have combined real actors with the stop motion animation. Pretty cool. That will really add an extra element of life to the animation. I don't know if the story is going to be any good, but too bad films like this (especially ones five years in the making) get very little distribution outside of film festival circles and the occasional DVD. I wish they'd show short films prior to the main feature when you go to the movies, but apparently cramming more advertising and trailers is more profitable. Too bad. Short films can be quite wonderful, but we don't have many venues for them. I'm continuing my stone carving education by taking a power tools class. I'll be using an angle grinder primarily. I just had my first class today. Using the angle grinder is definitely different from using just hammer and chisel. For one thing, you can remove material much more quickly. About as quickly as using a cold knife on cold butter. Which is pretty fast if you think about the fact that the butter in this case is actually stone. It works quickly enough that I need to plan more carefully. The other aspect is just the fact that the broad spinning disk is just different, dang it, from using a variety of pointy chisels. Anyway, I had a couple of spare stones to work with. I had intended to use them as experimental pieces. So, I'm not even sure how good the stones actually are. I chose this one just because it is so interesting. I live my life by these fortunes. This is me at the end of the first day. Can you believe that shirt started out black? Oh... Alright, alright... I'm lying. It was beige to start with, but it is holding about a pound of stone dust in its fibers. As you can see, we are practicing proper safety procedures in this class: safety goggles, respirator, and ear plugs. 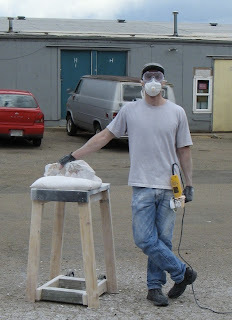 That bench I'm leaning against was designed (and mostly built) by one of the previous students who is skilled in carpentry. It's a good little bench. We built several of them, and I have one just like it that I use at home. 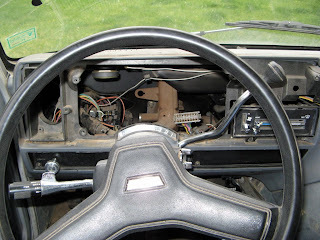 I thought I'd push that ugly picture of my van's dash out of the main page of my blog. This is a picture of what I see when I step out my front door today. It's a hazy day. So, it's not the best picture. But I guess I can see why people like it here. This really wasn't the reason I came here. Having grown up in the mountain states, I tend to take all this grandeur for granted. My loss. I have to say that I was disappointed with sunsets when I moved here (that mountain is to the west of me). It's hard to compete with the sunsets of New Mexico. Especially the sunlight filtered through a gypsum haze (Yo, Alamo, what's up?!). However, the place I currently live has given me unencumbered views of that mountain, and I've learned that there is more to a sunset than pretty colors. 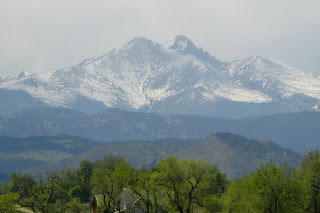 Given the right cloud cover, that mountain produces dramatic scenes. I'll try to capture one before the summer is out. What the heck. Here's another doodle in ArtRage. I hadn't intended to draw a werewolf. 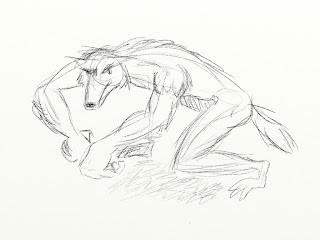 I simply started by drawing a stick form (which you can still see), and somehow the werewolf came to mind. I'm trying to carve out more time for this sort of thing. Now I need to try my hand at finishing some of these. My doodle's tend to look better than my finished jobs. Oh well. Practice make perfect, and the cool thing with all this digital technology is that it is so easy to save these images and use them as reference. In the bad ol' days, I had to use a light table which tended to limit what I could render on to only what I could shine a light through. And forget about the despair involved in spilling ink all over a piece. Anyway, enough about the dark ages. You may have noticed I am playing with some things like scanners, hammers, chisels, clay, and cameras. I suppose people of a certain bent would identify a theme there and attempt to reduce my activities to a word or two, but I'm not one of those sorts of people. I refuse to acknowledge any such theme. There is no unifying thread in this blog other than I'm writing all these posts. However, if I were the type of person who attempts to reduce everything to some sort of identified pattern so that it can be quickly dismissed out of hand, I would probably recognize a continuation of the purported theme with this: ArtRage. I've been playing with that program recently. I've only had a little bit of time to use it, but I like what I've seen so far. In a nutshell, ArtRage is an art materials simulator. In other words, you can create images with your computer using methods very similar to painting and drawing. It goes so far as to attempt to simulate things like paint drying (insert joke here), the type of material your canvas is made of, how different material blend and mix together, and how much paint you have loaded on your "brush". It seems to do an admirable job at these things. A person with experience working in physical media would probably be initially frustrated since you don't get all the normal sensory feedback, but if they gave it a chance, I think they would quickly adjust to the program. A person with no experience working in physical media may also be initially frustrated (at least with the more esoteric features of the various media), but I think they could also quickly adapt. Keep in mind that the program is strictly a painting/drawing program. It doesn't bother with frivolous things like region selections or box/circle/line drawing tools. It's not a pixel perfect image editor. There's not even a way to type text. The program is solely focused on mimicking traditional methods. The only computer-like features ArtRage gives you while working on your images are undo/redo, layers, and a surprisingly useful reference photo pin up feature. You won't be using this program to create diagrams for your next business meeting or touching up your photos, but that's not what it is for. While Ambient Design has put a lot of effort into simulating the various materials, it is still possible to tweak the various media and materials to achieve not-so-traditional effects if that is what you want. I just throw that out there for those of you who might find the idea of a true simulator a little daunting. To give just the most bare minimum taste of what this program can do, I've uploaded a very rough sketch I drew in a minute or so using the pencil and paper capabilities of ArtRage. When I say a minute, I'm not bragging about my skills (I am so not bragging). I just want to emphasize how simple it was for me to just pick up and use. Other than using a tablet (more on that in a second), creating this rough sketch was about as close as you can get to feeling like drawing on paper while working with a computer. If I hadn't told you I had drawn that directly in ArtRage, you probably would have assumed it was a scanned image of a real world pencil and paper sketch. 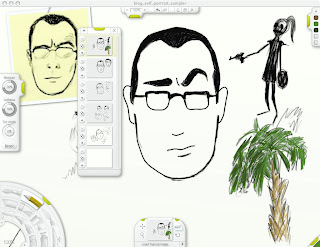 The above picture is a screenshot of the ArtRage application window. You can see the reference picture feature in action. I placed a self-portrait (also created in ArtRage) in the upper left-hand corner while I worked on a crummy cartoon self-portrait. The long window hovering in the center shows the other layers that I had created. The only thing you can't see is the color picker which I tucked away in the right hand corner. The interface is a little off-putting at first if you are used to applications looking a certain way, but I think Ambient Design has done an excellent job with the design and implementation. Most features are accessible from the application window and the little sub windows. You can work quite efficiently within the screen and never have to give things too much thought or jump to the menu. Which is exactly what you want while you are deep in throes of artistic passion. By the way, all the hovering windows you see are smart. If you are drawing on the canvas, and you approach one of the windows, they will instantly disappear to get out of the way. I've played with some of the other media that ArtRage supplies, but I only did so with an eye for achieving other effects. So, I can't comment on how well the paint simulation appears to work. However, other people have stated they like the paint media ArtRage provides even better than its pencils. ArtRage provides a complete little art studio in your computer for only $20, and you don't ever have to clean up when you're done! In fact, it's probably the best little painting software you can buy at that price (it's certainly the most fun). To get more features and capabilities with competing programs will likely require you to drop at least five times that amount (most likely ten times that amount). So, what's not to like? 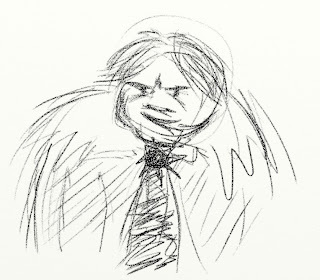 The only downside to ArtRage isn't really the fault of ArtRage. To really get the most of this program, you will want to have a graphics tablet (or maybe a tablet PC). You can use all the features of ArtRage with a mouse, but you will lose the pressure sensitivity that a tablet provides that makes painting programs work as well as they do. You can adjust the default sensitivity for the mouse, but the ArtRage experience won't be as smooth. Of course, if all you have is a mouse, and you really want a program like ArtRage. Go for it. There's a free preview, and if you like it, it's $20! I'm sure you've spent more money on other occasions and received much less in return. If you already have a tablet, you should give ArtRage a spin. At the very least it will provide a nice break from all the expensive tools you are probably already using. By the way, that little self-portrait I've just installed as my user profile picture was drawn using ArtRage. The fact that it appears like something you might see while watching America's Most Wanted (insert joke here) is not the fault of ArtRage. Here's some examples of what an experienced artist can do with ArtRage. Here's a review that compares ArtRage to a more expensive alternative. And one more link to ArtRage itself. Anyway, I had linked to this particular site earlier (over on the right), but took it down shortly after. However, I think this particular panel is definitely worth a small amount of your time. Don't forget to hover your mouse over the image for even more fun! It's a good way to start your week. I like A Softer World's dark humor, but it may not be to everyone's taste. You should feel free to try some of their other stuff, but be prepared. It ain't all puppies and kittens. Sometimes it's zombies! Despite my long career as a Human Resource what works with computers and such, I have lost touch with the price/value ratio of pretty much all computers and accessories. I just lost enthusiasm for tracking that crap a long time ago. But I wasn't looking for a printer. Just a scanner. They did have some combo units (scanner, printer, etc.) at the $100 price point, but I decided to just focus on what I wanted to get right now: a scanner. I came across the CanoScan LiDE70 which you can find selling from $70 to $90. It's just a scanner and it doesn't require yet another power brick. It is powered from the USB bus. I picked one up. I haven't used it much, but it seems to work well and fast (compared to my experience with previous generation models). The main beef I have with it right now is that it generates a highly annoying whine while it scans. Luckily I'm not scanning tons of documents, but if I knew it was going to sound like it does, I would have seriously considered another model (maybe the HP G3010). I didn't mean this to sound like a review or anything. I haven't used that scanner enough to call it good or bad. I just wanted to express my astonishment of how inexpensive some technologies have become. I suppose it was inevitable, and certainly moving all manufacturing overseas seems to have paid off. Hopefully inexpensive does not mean shoddy in this case. Anyway, when I need to take a mental break from my work as a Human Resource, you can often find me "mindlessly" filling pages of graph paper with doodles. 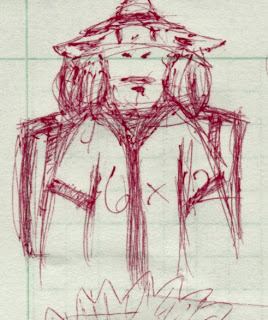 Lately I've been using a red micro rollerball pen from Uniball that seems to be slowly running out of ink. 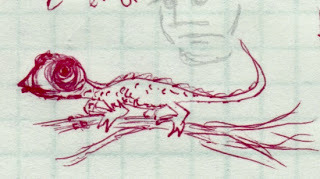 The doodles are often tiny (I guess I'm trying to be inconspicuous), but here's a couple of silly examples of what my new scanner can pick up. The grid, if you can make it out, is spaced at centimeter intervals. Teeny-tiny. The image to the left is a sculpture by Lawrence Northey. I've seen his work presented in the Spectrum annual. I've always enjoyed his works when I've seen them in print. 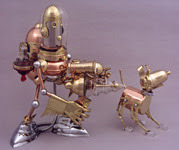 I've yet to see them in person, but his works are clearly imaginative and whimsical. Anyway, I hadn't thought about his work in a while, but Charley Parker of Lines and Colors (one of my favorite blogs) recently posted some good comments which made me realize you guys may also be interested. I won't say any more since Mr. Parker has already said it better than I would have. Check 'em out. I've been working on another sculpture for a while now. Actually, this is the second time I've started this particular sculpture. The first time didn't quite work out. 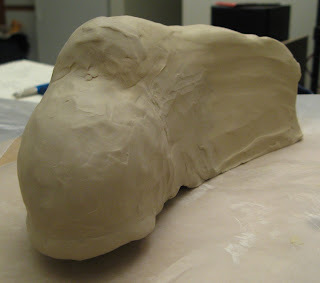 I made the mistake of making my clay model larger than the stone I was going to sculpt. Oops! Somehow I find scaling something down harder than scaling something up. Additionally, the stone had a nasty flaw that prevented me from continuing with my original idea. In the end, I think the mistakes and the flaws were for the best. The sculpture really wanted to be larger than it would have been with the first stone. I picked up a larger stone and started again. Things have gone much better. I don't want to reveal it all just yet. So, here's just a taste. Man, I wasted a lot of words in my own post about Feist. Jeffrey Rowland really hits the nail on the head. "New Feist album is out today! If it's half as good as her last one it'll still be three times better than the average album. Feist is not one of those musicians who just makes as many notes as possible all willy-nilly and calls it is a song. She also doesn't make songs where she just speaks loudly and crudely about cars that cost more than houses and compulsory, frequent coitus with numerous, anonymous partners. Feist places each note exactly where it is supposed to go and sings like an angel with a new puppy." You can see the full post here (which doesn't discuss Feist any further), but only click that link if you aren't bothered by comics that discuss internet addiction while simultaneously implying a murder on a golf course. I can't believe I just wrote that sentence. OK. So, it's not really gross. I just figured I'd let you guys laugh at the consequences of my intransigent refusal to buy a new car. The above picture is what I currently see when I'm in the driver's seat of my van. Don't worry. It'll probably be fixed tomorrow. I'd tell you the rest of the story involving broken speedometer cables (followed by broken speedometer head), u-joints, and power steering pump hoses that required machining because they no longer make the parts, but I've already bored you. Maybe this is finally the last major repair I have done to the beast. Maybe it really is time to blow a wad of cash on a future POS. I was born in a time and place not of my choosing. Since then I've tried to make the best of it. Unless otherwise noted, this work is licensed under a Creative Commons Attribution-NonCommercial-ShareAlike 3.0 License. This does not apply to any third party images used for linking purposes nor to embedded videos. The copyrights for those items are obviously retained by the original copyright holder. Comments are copyright their respective posters.